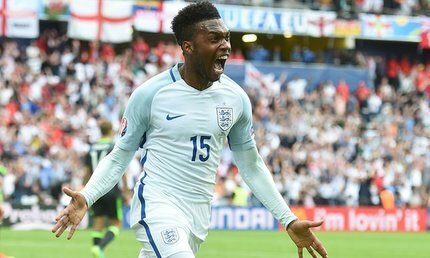 Jamie Vardy and Daniel Sturridge made the difference against Wales to secure a 2-1 win. England take on Slovakia in the final Group B game at Euro 2016, knowing a win for the Three Lions will guarantee a last 16 knock out tie against a third place qualifier from either Group A, C and D (potentially facing Romania, Northern Ireland or Czech Republic). England could top the group with a draw, if Wales fail to beat Russia in the other final Group B game (happening simultaneously). England could even potentially go through with a defeat, given the new format of the enlarged Euro 2016 tournament where 4 of the 3rd placed teams get through. England come into Monday’s game on a high after an impressive second half turnaround 2-1 win against Wales. England had to rely on super subs Daniel Sturridge and Jamie Vardy to grab a late win, and it’s likely both could feature in the starting lineup against Slovakia. Raheem Sterling and Harry Kane both looked leggy and out of form, and so seem most at risk of missing out against Slovakia. A lot has been in the press over the last few days about Raheem Sterling’s poor performances at Euro 2016, with the general mood summed up with the news a fan has launched a crowd funding page in order to buy Raheem a ticket home! Generally England have performed well, with notable performances at Euro 2016 from Kyle Walker, Wayne Rooney, and Eric Dier. Daniel Sturridge looked particularly good, appearing to have an extra yard over every player on the pitch - one of the few players on the field willing to pick up the ball and dribble past players. There's no doubt Daniel Sturridge must start against Slovakia! It’s all looking positive and bodes well for England’s chances of further progression to the latter stages. Before the Wales game I wasn’t so confident that Hodgson would have the bottle to start with one of or both Vardy and Sturridge, but I have renewed optimism given the manner of the second half display against Wales. The media noise is indicating that Sturridge will replace Kane for the Slovakia game, with Vardy or Wilshere coming in for Sterling. The shackles are now off, England’s young lions can really express themselves and I think that game marked a significant turning point in England football team’s new identity and confidence. England’s strengths firmly lie in its attacking options and Thursday afternoon in Lens completely vindicated that. Slovakia, who are one point behind England, on three points after two games, will be desperate to grab all three points against England to guarantee qualification for the last 16 round. Slovakia will feel unlucky not to have gained more points, having arguably done enough to earn at least a draw against Wales in their first group game to add to the three points earned against Russia in their second game. Slovakia have no reason to feel overawed, given they have beaten the current World Champions, Germany and the current European Champions, Spain in the last two years. Slovakia have only lost one game in their last 10 matches (against Wales), although in their short Football history have never managed to come away with even a draw against England in three previous meetings. The aggregate score over those three games is 8-2 in favour of England. Slovakia do possess some quality players, most notably the Napoli attacking midfielder Marek Hamsik, who is one the most technically gifted players at the tournament. Marek Hamsik and Vladimir Weiss have a good partnership down the left side of attack for Slovakia, which will present a stiff challenge for England. 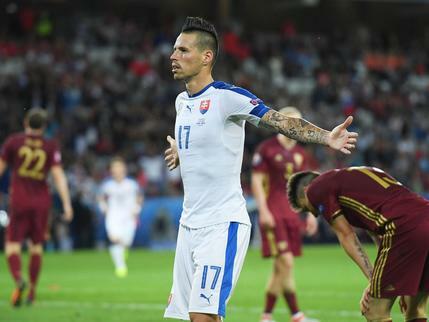 Hamsik scored one of the early nominations for goals of the tournament against Russia, and the five time Slovakian footballer of the year will look to inflict similar damage on England. Slovakia have never beaten England. In all of Slovakia’s last 6 wins, Slovakia have conceded at least one goal in those matches. England’s 2-1 win against Wales, was the second time in their last 14 matches at a major tournament that they have scored more than one goal. England last played at the old style Stade Geoffroy-Guichard in St-Etienne at World Cup 1998, losing on penalties to Argentina. England should win against Slovakia, and I’m confident Slovakia will be on the wrong end of a strong England display in Saint-Etienne. England have been threatening to put a team to the sword all tournament, and Slovakia may just be the team that suffer the direct consequences on Monday evening. England to win and both teams to score (best priced at odds of 7/2). Bet now with Coral! Daniel Sturridge – First Goalscorer (best priced at odds of 9/2). Bet now with bet365! Over 2.5 goals (best priced at odds of 13/10). Bet now with bet365!